Ross Mathews is a television personality who got his start as a correspondent for The Tonight Show with Jay Leno. He is a series judge on the Emmy Award Winning RuPaul’s Drag Race, was voted “America’s Favorite Houseguest” on the inaugural season of Celebrity Big Brother, and is currently the co-host of the CBS/Facebook produced Off the Block with Ross and Marissa. 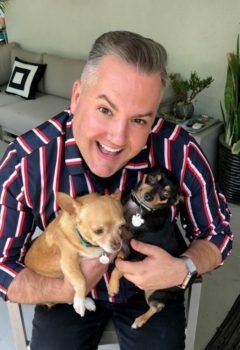 In addition to his work on television, Ross can be heard weekly on his top-rated podcast Straight Talk with Ross Mathews and is a best-selling author of the autobiographical Man Up!. Ross loves to spoil his paw-fect puppies… Selena and Audrey!